“Surely He shall deliver thee from the snare of the fowler; and from the noisome pestilence. “The clown Papageno is the spirit of the opera’s character. He manifests a playfulness and innocence. 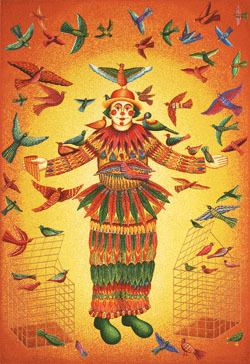 Papageno decides to release all his captive friends and opens the golden cages. Aurora Serigraphic Studio, Van Nuys, CA. Completed November, 2008. In Swanson’s depiction of Papageno, this avian hunter is more of a friend to the birds than a captor. The cages are open. Papageno with his uncaged flock is an allegory: the birds are free, yet they choose to remain close to the clown, swirling joyfully and perching upon his arms. Clowns are essentially transfigurative beings. In Magic Flute and other narrative works, they serve as comic relief as they accompany the hero on a perilous journey. A clown’s character is drawn from story and myth. Armed with images from the collective unconscious, they bring more to the story than merely the character they portray. These are beings of magic possessing the power to transform the ordinary into the unusual. They are imbued with symbolic power, the ability to convey truths and meaning to the human heart in a way that bypasses the critical intellect. John August Swanson’s PAPAGENO owes as much to the stories of Saint Francis as to Mozart’s opera. Saint Francis heard the joyful singing of birds while he was heavy of heart and interrupted his morning prayers to approach them with another friar. Rather than fly away, the birds gathered close. He asked them to be quiet so the men could complete their prayers and the birds complied, singing again only after the two men finished praying. Francis regarded animals as equals, recognizing the subtle bond that human beings share with nature, all the handiwork of a Creator. Birds appearing in dreams are often viewed as symbols of freedom. They may also represent thoughts, imagination and ideas that, by nature, require freedom to manifest. In ancient times, birds were believed to be vehicles for the soul possessing the ability to carry the spirit to heaven. As clowns cross borders, standing astride the earthly realm and the imagination, so are birds at home in the air as they are on the ground. A caged bird may suggest restraint, but birds flying freely represent our desires and aspirations - the possibility of the soul soaring into the divine.